I was so excited to post today, actually I could have posted sooner but Little Sister got sick this week. She's been running a fever for the last 2 days. Hopefully we have seen the worst of it. Yesterday evening her fever hit 103.5F! Of course I panicked and called the Dr. I got the after hours answering service and the Dr called me back within 5 minutes, which was great (I've had other Dr's that would take forever to call back.) Basically she told me not to worry, toddlers apparently tend to run fevers a lot higher than adults (up to 104-105) and still be ok. That seems a little high to me but I was reassured nonetheless. She gave me some instructions on alternating Tylenol and Motrin. After a nice bath my daughter went to bed with a much lower fever. I was relieved! Today she has woken up a little warm but in a much better mood than she was in yesterday. So anyway I've been thinking all week long about what to post and believe me, I came up with plenty of ideas. I better save some for future posts or I might run out of things to post! First an update on my DQS6 quilt. I need to get an updated picture because the one below is a bit old. 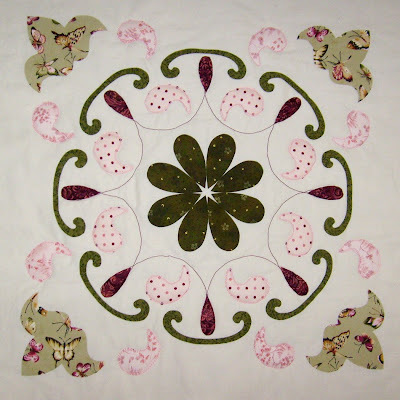 The good news: I have finished all the quilting around my shapes and now need to do the background quilting. The bad news: Somehow, (I have no idea how) I got a mystery stain on my quilt top! It's like a black grease stain. One minute I'm quilting away and the next thing I know... wham a stain on my quilt! I was so mad when I saw it, but try as I might I could not locate the culprit of said stain. It pretty much hindered my progress as I tried to figure out a way to deal with the stain. The solution: Luckily my little crafty brain has come up with the perfect solution. I won't post my solution until I get a current picture (so you can see the problem) so stay tuned and you too may be able to one day save a quilt! The other thing that has kept me busy this week is that I have been painting the trim in my kitchen! We actually never did it when we moved in about 1 year ago. Lately it's really been bugging me. Especially the laundry room door. It was disgusting, and no amount of wiping and cleaning it made a difference. Well I had a nice little tutorial all made up with tips on door painting... apparently it didn't save! Pooh! I could have sworn it saved, I'll have to search my hard drive for it. It's not that hard to repaint your trim or doors and it makes a world of a difference! So check back later in the week! One more thing! Check back later in the week for a great quilting tip and my first giveaway!! !